Boulder City High School swimming continues its winning streak, with both programs picking up lopsided victories over 4A program Rancho. Laura Hubel/Boulder City Review Boulder City High School senior Mandy Gebhart went in as the top seed in the 100-meter butterfly with a time of 1:03 on Saturday and, after a strong swim, held her first-place position swimming her best time this season, 59.93, in the meet against Rancho. Celia Shortt Goodyear/Boulder City Review Boulder City High School Senior Logan Cade Neilson completes a swing at a recent golf tournament at Boulder Creek Golf Club. Swimming past the Rams 188-57, seniors Mandy Gebhart and Montana Lloyd each placed first in their events to keep the Lady Eagles undefeated for the season. 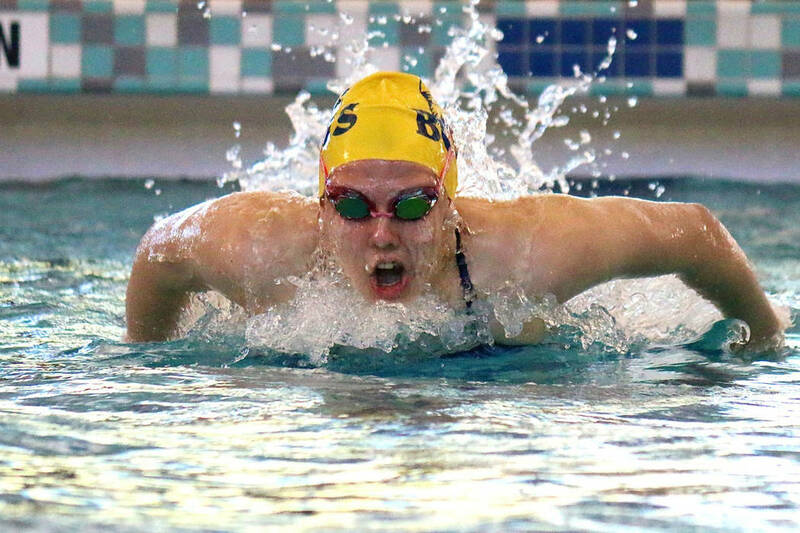 Looking to become state champions in their events, Gebhart finished her 200-yard freestyle with a time of 1:56.06, while finishing the 100-yard butterfly in 59.93 seconds. Lloyd finished her 100-yard freestyle with a time of 55.51, while finishing with a time of 57.40 in the 100-yard backstroke. Boulder City senior Sarah Estes was her closet competitor with a time of 1:03.80. Sophomore Aimee Garcia (50-yard freestyle and 100-yard breaststroke) senior Abby Sauerbrei (500-yard freestyle) and freshman Quinci Thomas (200-yard individual medley) each placed first in their individual events. For the boys, senior Braden Klouse (50-yard freestyle and 100-yard freestyle) and sophomore Paco Cuevas (200-yard individual medley and 500-yard freestyle) each placed first in their events to lead the Eagles to a 162-85 victory. Junior Robbie Leavitt and sophomore Chandler Larson also placed first in the 100-yard breaststroke and 200-freestyle, respectively. Closing their season out Saturday with a last chance qualifying meet at Heritage Park, both Eagles programs seem destined to make another state meet appearance. Boulder City High School’s baseball program continues to steamroll through league competition, picking up its sixth consecutive win following Monday’s 16-0 rout of Del Sol. Exploding for six runs in the first inning against the Dragons, the Eagles collected 16 hits, backed by strong run production from senior Kodey Rahr and junior Anthony Pacifico. Rahr (2-for-2, three RBIs) started off the first inning with an RBI single, followed by an RBI triple in the third inning. He concluded his day with a sacrifice fly for an RBI in the fourth inning. Having nearly an identical game, Pacifico drove in a pair of runs with a single in the first inning, followed by an RBI triple in the third inning to finish 3-for-4 on the day. Getting hot on the mound for the Eagles, junior Rhett Armstrong had his best outing of the season, throwing four innings where he struck out seven batters and allowed only three hits. Grabbing a win over Chaparral on April 27, the Eagles cruised past the Cowboys 11-6, avenging an earlier season loss. Armstrong earned the victory, throwing four innings where he allowed three runs on seven hits, while striking out six batters. Showing he’s more than just a pitcher, Armstrong led all hitters with a 3-for-4 performance with a home run, driving in four runs. With the regular season coming to a close, the Eagles will enter the 3A postseason as the No. 2 seed in the Sunrise. Continuing to roll toward the end of the season, Boulder City High School’s boys golf program tested its skills against 4A opponent Green Valley on April 26, picking up a 200-238 victory over the Gators at Legacy Golf Club. Picking up their fourth win against a larger classified opponent, two against Green Valley and two against Basic, senior Cade Neilson led all scorers as the only golfer under the 36 par with a score of 35. Upping his game behind Neilson, junior Jackson Wright tied for second with Green Valley’s Ty Klabacka with a score of 37. 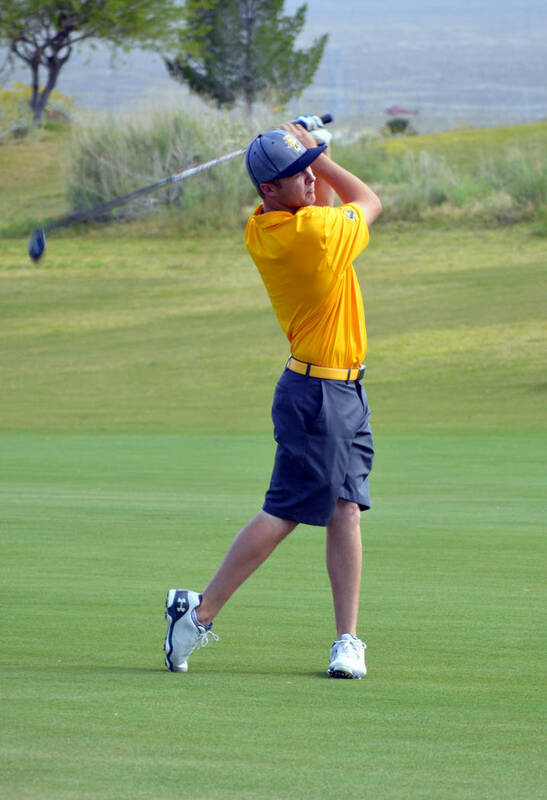 Senior Kyler Atkinson (38) and sophomore Kevin Phelps (45) paced the team with third- and fourth-place finishes. Finishing the regular season strong, the Eagles will travel to Boulder Creek on Wednesday for the 3A Southern Region Tournament. Wednesday, regionals, at Boulder Creek, 1 p.m.
Saturday, Last Chance meet, at Heritage, 10:15 a.m.